The Rapid hosts a variety of technology and comfort features including: 6 airbags, Multi-Collision Brake, 5" touch screen Swing radio with Bluetooth® audio and phone streaming, 6 surround sound speakers, 3-spoke multifunctional steering wheel, air-conditioning, cruise control as standard. 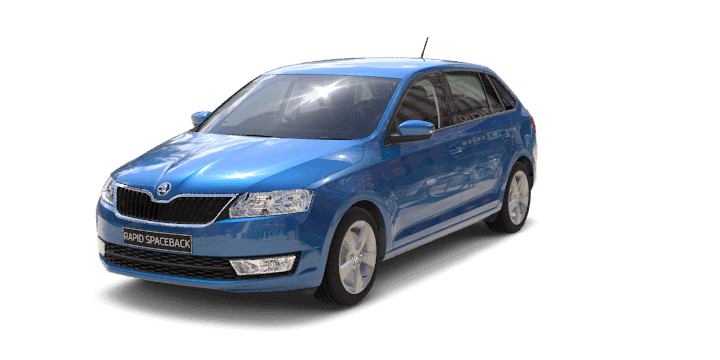 The ŠKODA Rapid gives you the unique opportunity to have your style and attitude reflected in your car. When you look at the Rapid in terms of space and with regards to size, this compact hatchback offers rear passengers outstanding space and headroom for a car in its segment. The luggage compartment also is exceptional for a car in its class. The last thing we want to happen to you immediately after an accident - is another accident. Electronic Stability Control (ESC) helps you maintain control of the car if it begins skidding, while Multi-collision Brake activates the braking system to help minimise any future collision. If you struggle with hill starts, you’ll appreciate Hill Hold Control (HHC). It’s activated automatically when the hill gradient is more than 5%, whether you’re driving forward or in reverse. When you release the brake, HHC keeps the pressure in the brake system for a few seconds, allowing you time to set off without rolling. Our clever engineers have developed a hands-on approach to help identify driver fatigue. Fatigue Detection◊∆ monitors your movement through the steering wheel. If it senses signs of fatigue, it sends an audible and visual warning, alerting you to stop and rest. The RAPID is packed with features for a rainy day. Light AssistΔ automatically adapts to changing light conditions, while the rain sensor adjusts the speed of the wipers depending on light or heavy rainfall. Combining the smarts of our car with your phone was a no-brainer. Smartlink^^ smartphone connectivity with Apple CarPlay® & Android Auto™ seamlessly connects your smartphone to your RAPID, mirroring your phone’s compatible apps on the internal screen. So, whether you want to listen to music or receive turn-by-turn directions, you can do it all without touching your phone. You know what else sounds great? Every RAPID comes with 6 speakers, equipped with ŠKODA Surround Sound, developed with leading audio brand Arkamys®. Plus, the 5” touch screen Swing radio has an SD card slot and USB with MP3 and WMA compatibility, as well as the ability to play/stream music via Bluetooth®. Now, let’s talk about what’s behind that pedal. Modern turbocharged engines with direct fuel injection ─ petrol TSI ─ save fuel while retaining driving dynamics. And thanks to the turbocharging, there’s plenty of power at low RPM, where the engine is most commonly used. When you buy a RAPID, you’re making a smart choice — for yourself and the environment. Green Tech~, standard across both petrol variants, features “Start Stop” and Brake Energy Recuperation. "Start Stop" automatically switches the engine off when stationary and starts it again when you want to drive off. ^5 Year/Unlimited Kilometre Warranty is available with private, general fleet and government vehicles only. 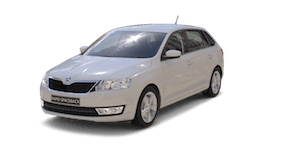 Excludes rental vehicles, hire cars, taxis, courier vehicles, driving school vehicles, security vehicles, bus and tour vehicles which are subject to a 5 Year/150,000 Kilometre Warranty. Your rights under this warranty are provided in addition to, and in some cases overlap with, consumer guarantees under Australian Consumer Law and do not limit or replace them. Click here for 5 Year Warranty terms and Conditions.